Having enjoyed the recent patch of incredible waves lately, the overwhelming thing I noticed in my surfing was a sense of ease. It was so enjoyable to not have to generate speed, the wave did all the work. The other thing I observed when surfing waves over 4 foot, was the amount of time available. No rushing was needed, big open faces that allow rail to rail surfing and invite flow and patience. But, lets face it, the waves aren’t usually like that. Mostly they are small and you need to be fast and light to keep up. This is where Parkour comes in. Parkour is French for “journey, route or course”. 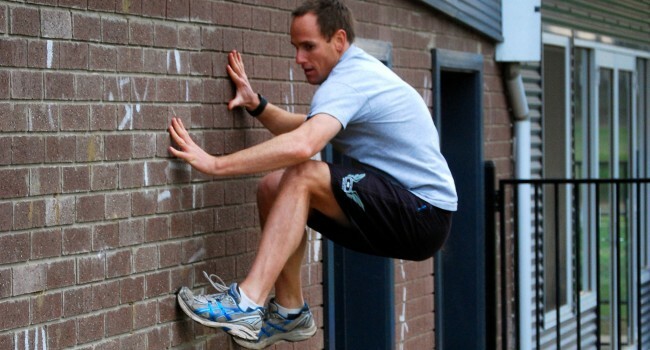 Parkour is a way of moving within your environment and overcoming obstacles of any kind be they physical or mental. The aim is to move over, around, up, along, under and through built and natural environments with exploration of mind and body as motivation. You may have seen footage of people jumping from building to building. This is Parkour at its highest level. In Parkour we see obstacles as opportunities, rather than barriers and explore fluid movement as a way of harmonizing with the environment. Jumping, twisting, rolling, balancing are all part of the Parkour experience. These experiences help us understand ourselves, and what we see as possible. Rapid movements create the need for spontaneous decision making and heightened awareness. The transfer to surfing is huge. The beauty of Parkour is the simplicity. Walls, benches, seats, hand rails, playgrounds are all now great opportunities. Skateboarding without a board. Right? *In the photo above we are using a wall to simulate a high speed turn. This is training the nervous system to react quickly with precision. A great way to learn how to surf faster!